The supplier to brands such as Calvin Klein, Michael Kors and Kenneth Cole has seen its exports more than doubled since 2011 to $729 million last year -- and it increased its factories two-fold to 35, betting on a big drop in tariffs from Vietnam’s membership in the 12-nation trade pact. Vietnamese clothing maker NhaBe Garment Corp. had a lot riding on the Trans-Pacific Partnership. With a pen stroke, President Donald Trump killed the ambitious trade agreement, a deal that promised to deliver an estimated 8 percent boost to Vietnam’s gross domestic product by 2030, according to the World Bank. Yet that hasn’t dented enthusiasm among multinationals for the communist country, which was on track to be the top exporter of goods to the U.S. last year among the Association of Southeast Asian Nations. Trump’s incendiary trade rhetoric directed at China and his threat to impose 45 percent tariffs on Made-in-China products remains a powerful incentive for companies to shift manufacturing to other countries, with Vietnam emerging as a strong contender. While TPP’s demise takes some of the shine off Vietnam, the country’s young and low-cost workforce are magnets for international investors. “Vietnam will continue to attract foreign direct investment in labor intensive firms as well as those that want to capture the burgeoning domestic market,” said Trinh Nguyen, a senior economist at Natixis SA in Hong Kong. Vietnam plans to continue its reform process and will fulfill trade agreement commitments, Ministry of Foreign Affairs spokesman Le Hai Binh said in a statement late Tuesday. The country has been enjoying a foreign investor-led economic boom for years as it transformed from mainly an exporter of agricultural commodities, such as rice and coffee, to a Southeast Asian manufacturing hub. Tainan Spinning Co., a textile company based in Taiwan that employs 4,500 workers in Vietnam, said in an e-mailed statement that the demise of TPP won’t affect its plans there. “Given the company’s strength and commitment, Tainan Spinning is considering further expansion in Vietnam in the second half this year,” it said. Few China alternatives can match Vietnam’s low wages that are about a third of its northern neighbor as well as good access to ports, said Joseph Incalcaterra, Asia economist with HSBC Holdings Plc in Hong Kong. “Vietnam still looks quite good,” he said. 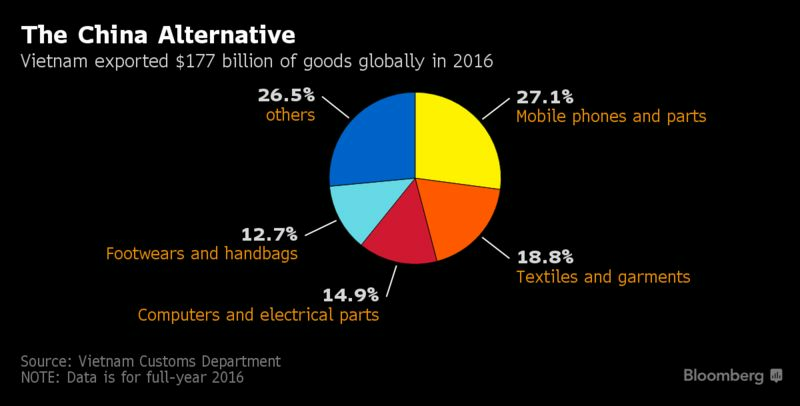 Companies that may need to look for China alternatives include Yue Yuen Industrial Holdings, a major supplier of shoes to brands including Adidas AG and Nike Inc., according to Bloomberg Intelligence analyst Catherine Lim. Yue Yuen and textile maker Shenzhou International Group Holdings “may shift production to factories in countries such as Vietnam and Indonesia to mitigate the impact on customers” of U.S. penalties against Chinese imports, Lim wrote in a Dec. 14 report. Yue Yuen relies on Vietnam for more than 40 percent of its production, according to a spokeswoman, thanks to its low salary costs, local government support and a skilled workforce. “We don’t expect any material impact from TPP on our decision of Vietnam production line,” the spokeswoman said. There’s no question that TPP would have been a big win for Vietnam. Vietnam’s exports to the U.S. climbed 15 percent to $38.5 billion last year, according to Vietnam Customs. Textiles and garments account for almost 19 percent of Vietnam’s exports. Also, as Nguyen with Natixis pointed out, “Vietnam still does not have a free trade agreement with the US -- a very important trade partner and the largest economy in the world.” TPP would have reduced tariffs in Vietnam’s key footwear and garment industries. U.S. companies in Vietnam were disappointed by Trump’s move. “The President’s action to withdraw from the TPP is bad news for American and Vietnamese companies, investors, workers, farmers and consumers,” Adam Sitkoff, executive director of the American Chamber of Commerce in Hanoi, said in an e-mailed statement. 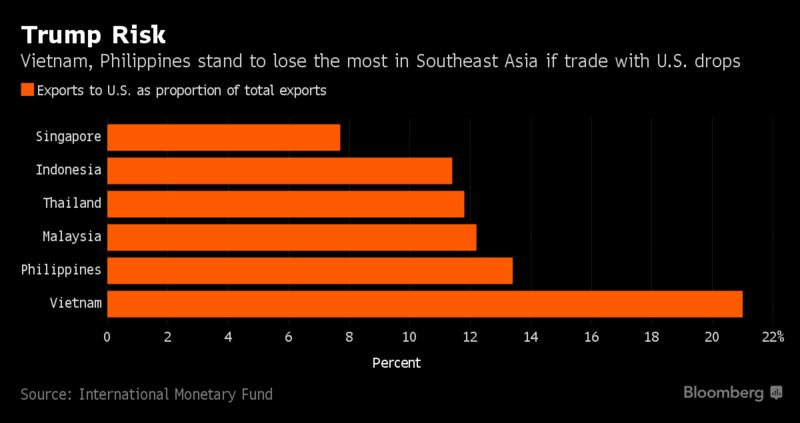 Still, there are signs that Vietnam has already made the transition to the post-TPP era. Last year, despite the announcements by Trump and Democratic rivals Hillary Clinton and Bernie Sanders against the trade deal, Vietnam continued to attract foreign direct investment in record numbers. The country’s FDI hit a record last year, growing 9 percent to an estimated $15.8 billion. Manufacturing and processing accounted for the bulk of pledged foreign investment, led by two Korean projects: a $1.5 billion investment by LG Display Co. and a $550 million investment by LG Innotek Co. The impact of U.S. withdrawal from the TPP on LG Display’s operations will be limited, the company said in an e-mailed statement on Wednesday. The decision to invest in Vietnam "was not purely based on a tariff benefit issue," the company said. "Therefore, there will not be much change in our decision on investment in Vietnam or on our business strategy there." As part of the TPP negotiations, Vietnam’s government agreed to accelerate reforms to state-owned enterprises. While the TPP is unlikely to proceed without the U.S., the government isn’t going to retreat from those investor-friendly reforms, according to Vu Tu Thanh, chief Vietnam representative of the U.S.-Asean Business Council. That should help Vietnam and other Southeast Asian countries avoid suffering from a post-TPP investment letdown, he said.